Happy Show and Tell Friday! Today I'm sharing some of my plates that I have hanging all along the ceiling of my kitchen. It took me awhile to collect enough of these to go all the way around. 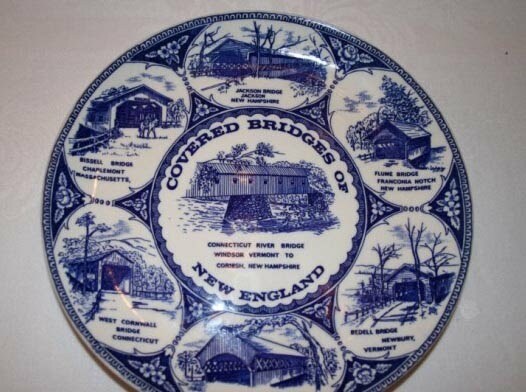 In addition to the traditional transferware plates, I also have some souvenir plates. I think I found both of these on eBay a few years ago. One is from Boston and the other shows different covered bridges in New England. I'm a California gal but I just love New England! I don't think I could live there because I've only lived in the mild climate of California and I could never handle the humidity in the summer and the cold winters but it sure is a beautiful place to visit! If you are joining in on Show and Tell Friday, please remember that your Show and Tell needs to be something from your home or garden. Please read the Show and Tell Guidelines for step-by-step instructions on how to participate. If you would like to join in, please enter your name and leave your exact Show and Tell blog post link, not just your blog link and as a common courtesy link back to my blog. If your link has been removed, please re-read over the guidelines before re-posting, or e-mail me with any questions. Thank you! I look forward to seeing everyone's posts...it may take me awhile to get around to visit everyone since I work full time but I'll do my best to get to your blog as soon as I can! Your blue plates are beautiful! I spent part of my week, in Minnesota at the Betty Crocker Kitchens, so I'm sharing a dessert that we made there. You have a beautiful kitchen. Love how you decorate it. P.S. So sorry. I made an error in the above post and deleted it. Loved the plates, Cindy. Just darling and they look so nice in your bright and cheerful kitchen. And, of course, I'm so happy you love New England. That's where I live and it truly is a beautiful area of the country. I love the four seasons, including winter! I love face-freezing weather. The humidity in summer, yeah, is not the best but it doesn't last long. ha! Autumn is splendorous here and spring is also rejuvenating. What a pretty kitchen... love the blue and white. Sweet plates! I always enjoy seeing your blue and whites - love that color combination. I always love your kitchen! So pretty! Hi Cindy, I First saw your Christmas tree a while back and I saved a picture of it. 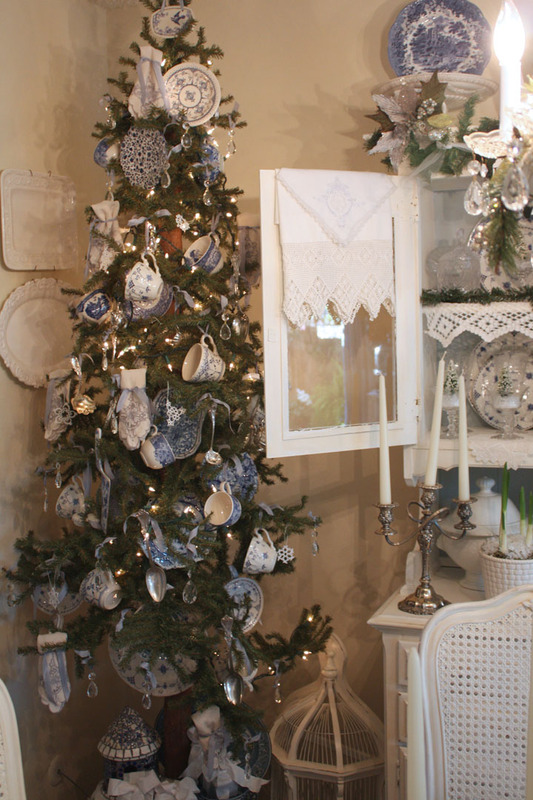 I am a huge fan of blue and white transferware so this tree is right up my alley! I so love BLUE and love all of your blue and white. I love your blue and white Christmas tree! I'll have to tuck that away in my inspiration file. Blue & White transferware always looks great! We do have several pieces from my Mother-in-law, some Dutch Boerenhoeve pattern, from 1930s Société Céramique Blue. Thanks for sharing your lovely collection! Cindy, love your kitchen and I am generally not a blue fan. But yours is darling, fun finds all your plates. I have always loved your dining room when you do this for Christmas, wonderful! I love your blue and white kitchen! Your plate collection is beautiful. All your blue and white plates look so pretty! and love the "tea" tree! I love your gorgeous collection of plates! They look wonderful on the wall there too. I also loved seeing your Christmas tree decorated with your blue and whites! I have Christmas on my mind too and have linked up some Christmas ideas from my new Christmas blog! Using your plates as decor in the kitchen is such a great idea. Fridays are my favorite because of your "Show and Tell". How fun to see the collections and artistry and giftings of so many gathered into one place. Thanks for being the gracious hostess. Blessings. I love the blue and white. So pretty! Thanks for hosting again. Very beautiful and what a great way to decorate and heighten the room! Cindy you have a beautiful collection!! I love it!! And your kitchen is wonderful! I would do some damage in that kitchen making all sorts of goodies. The blue plates are a perfect match!! Blue is my favorite color and I have a weakness for tea cups and tea sets...so your tree would have to stay up year 'round at my house!! 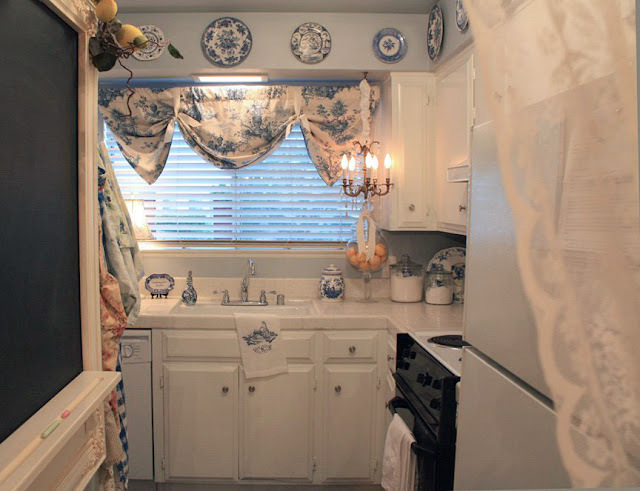 Cindy your blue and white kitchen and dishes are so pretty. I love looking at your blog and each time I stop by I find something even more beautiful and unique than the time before. I love your kitchen Cindy ~ I thought surely this must be a magazine photo - but its yours you lucky girl! 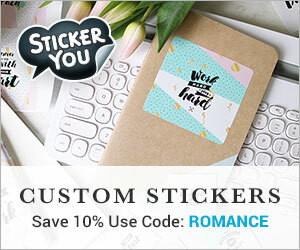 Thanks so much for hosting - gorgeous ideas everyone!! This is my first time for show and tell, thanks so much for hosting it! Love your kitchen and the blue plates! Your beautiful kitchen just goes to show that small can be beautiful...especially for those of us who hate cooking, sugar! I'd prefer to eat out 5 nights a week and then have a chef prepare the other 2 nights. Works for me, chickee!!! Cindy - The tree is delightful! Your plates are wonderful, of course. Thanks for hosting! with all the tea cups and plates. I love your blue and white transfer ware plates. Neat idea with the Christmas tree. How do you hook those on? Thanks so much for Show and Tell Friday... it fits my life these days with all of the things that I have inherited from my parents in the past two years. It gives me a chance to write about them and to reflect on some wonderful years. Wonderful kitchen!!!! I love the color - blue. Very charming your Christmas tree. Your home has lots of style, the words are: Romantic and Elegant. Hugs. Fatima-Scrapart. Hi Cindy, your blue and white looks terrific -- love the way the plates are arrayed on the soffit to pick up the color. Well done. So happy to see you today for Show & Tell Friday, my friend! 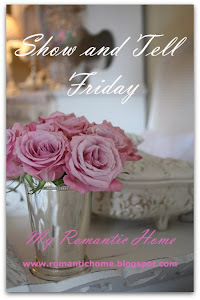 Thank you so much for hosting this fabulous Friday party...I always enjoy participating! Well my friend, I just adore your beautiful blue and white kitchen! I remember the first time that I seen it on Rate My Space! 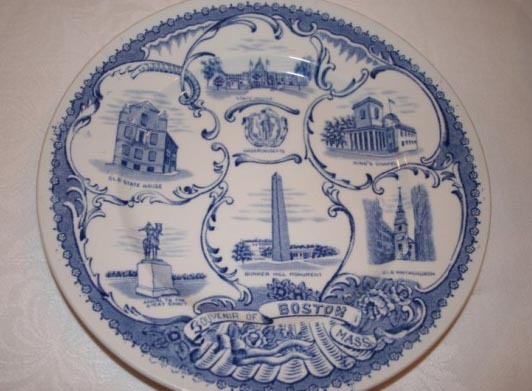 Love all of your pretty blue and white plates...bet you've had so much fun collecting those! Ohhh...and I love, love, LOVE your fabulous blue and white Christmas tree! It's simply gorgeous! Thank you so much for sharing more of your fabulous home, Cindy...it's always such a treat!!! I just left another comment but...where did it go? I just wanted to invite you over to read my post for Kelee's party. Your kitchen is so beautiful!!!! I'm just in love head over heals! White and blue are my favorite combinations! Wall Plates are objects of my collection! I loved the idea of a Christmas tree with cups and dishes, unusual, it was beautiful! i just love your blue and white kitchen! so fresh and pretty!! Dear Cindy, a lovely collection all around you kitchen... and oh an awesome christimas tree!!!! such a great idea to hang teacups so beautiful!! !